The government, cool and enumerating. The defense, impassioned and nimble with citations. Two appeals court judges. (The missing third: victim of a cancelled flight.) And one numbingly technical issue about computer searches, FBI software, and the Fourth Amendment. 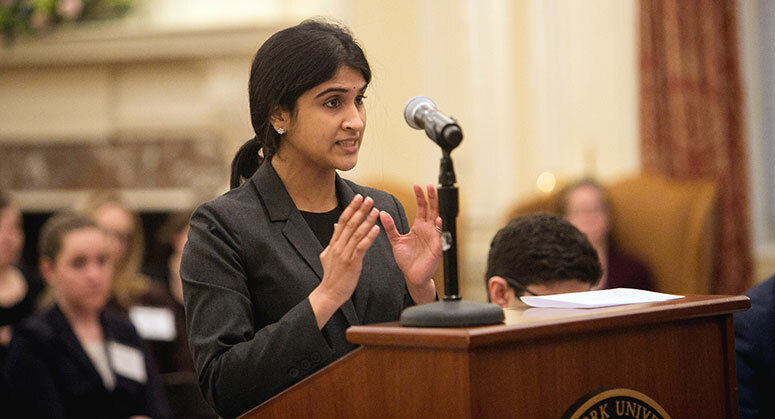 The stakes were high in the final argument of this year’s Orison S. Marden Moot Court Competition. This ringside reporter had not read the briefing, and so watched the argument without the benefit of facts or background, or much memory of criminal procedure. A bit like watching a match between two players you know nothing about—you can admire the backhand winners and footwork and net play without knowing the players or the narrative arc of the tournament. The advocates for the government opened the argument, and acquitted themselves well. 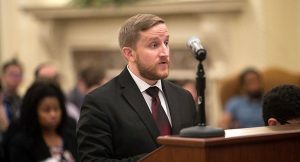 Tyler Domino deftly fielded questions about Brady v. Maryland and coolly broke down the mechanics of the Network Investigative Technique (“NIT”), the computer search protocol at the heart of the case. There was much talk of “keys” and “payloads” that has surely confused judges, magistrate and district, around the country. Caleb Seeley argued that the social costs of excluding truthful evidence were high, echoing our own crim pro professor, Andy Schaffer. (In attendance, Professor Schaffer—trial lawyer in his bones—scrawled meticulous notes on a legal pad throughout the arguments of his current and former students.) Counsel for the respondent-defendant struck back hard: Dan Peck, arguing the Brady point, reeled off case law from every time zone, at one point citing a case from the Western District of Arkansas. Mathura Sridharan, closing out the arguments, said allowing the government’s search would “eviscerate the particularity requirement” of the Fourth Amendment’s warrant requirement. 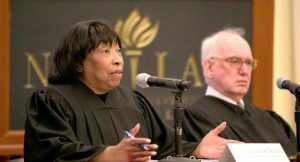 After she had waved the guts of the Constitution aloft, the government rebutted, and the judges retired to confer. Mathura’s force and verve carried the day. She won Best Advocate, the 2L defeating the trio of 3Ls in their last, well-fought Marden. (The crowd was left, however, to wonder which party had prevailed in the matter. An informal poll of students and a law professor in the audience suggests the government might’ve carried the day.) 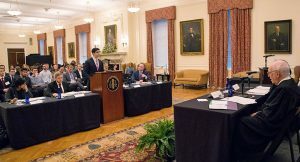 The judges reflected on oral advocacy for a bit and reminded us, as they do annually, that the quality of argument at NYU was higher than much of what they see in their courtrooms. My aisle-mate and I wondered why we had never done Marden—a shame, given how much fun the thrust and parry seemed, how lawyerly our classmates were, how rare the chance to argue in front of these judges. Oh, well—I hadn’t tried out for Law Revue (the musical) or taken Corporations or gone to office hours as much as I should have, either. Why worry, though, with only a few weeks left before graduation? It’s all… a moot point. This entry was written by Russell Rennie '17 and posted on April 20, 2017. Russell grew up on Air Force bases around the country before spending the last decade of his life in Boston. 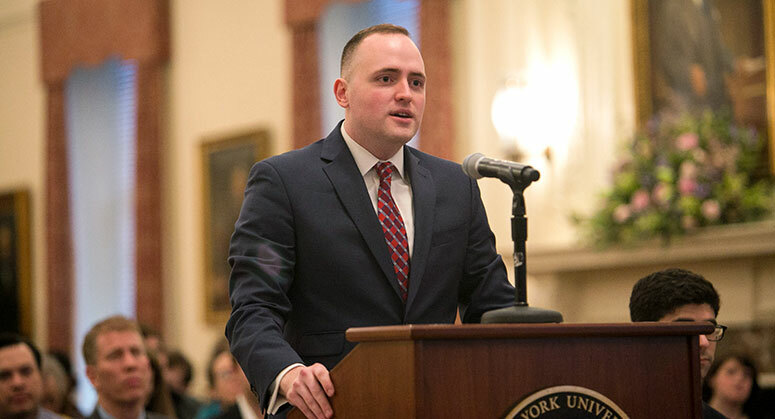 Before NYU, he taught eighth-grade social studies and worked on access to justice issues in a legal aid office. When not studying, he enjoys running, making cocktails, and hanging out with his nieces and nephews.